This is the first game in the God of War series. For other games in the series see the God of War category. God of War is a game for the Sony PlayStation 2, released on March 22, 2005. It is a third-person action-adventure that follows the story of Kratos as he travels across Greece in an attempt to kill the titular God of War, Ares. God of War was released on March 22, 2005 in North America and June 21, 2005 in Europe and is also available in the PlayStation 2's lineup of Greatest Hits. 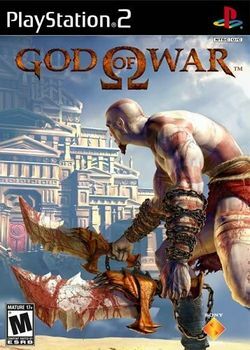 The game and the subsequent sequel - God of War II - were released in North America on November 17, 2009 as part of the God of War Collection, featuring ports of both games to PlayStation 3 hardware with up-scaled graphics and support for PlayStation Trophies. Loosely based on Greek mythology, the game focuses on protagonist Kratos and forms part of a saga (chronologically the second chapter in the God of War series) with vengeance as a central theme. As a third-person camera game, the player controls the character Kratos in a combination of combat, platforming and puzzle game elements. The player typically has to navigate Kratos through a long series of tests, trials and mazes to reach goals. Kratos' main weapons are the Blades of Chaos, with secondary weapon the Blade of Artemis also being acquired. Magic is also acquired, with four different attacks being available: Poseidon's Rage, Medusa's Gaze, Zeus' Fury, and Army of Hades. The relic Poseidon's Trident is also obtained, which allows Kratos to breathe underwater. Kratos also temporarily wields the Blade of the Gods during the final fight with Ares. This page was last edited on 2 March 2016, at 00:30. This page has been accessed 64,733 times.